the scent of green bananas: strawberry double cheesecake. Posted by santos. This entry was posted on 20080205 at 2:00 PM You can skip to the end and leave a response. The cheesecake is a beauty! Cool and light looking. Lovely photo. hi acornbud, i think i prefer the lighter japanese cheesecake to the new york style one. i'm not completely sold on the rare one, but it works pretty well combined with the baked one. Awwww..!! yer too sweet..!! thank you ..!! i love the cheesecake.. so pretty..! i bet they were yummy..!! Oooh looks yummy! I'm so glad I discovered your blog through Tastespotting - it's fabulous! That double cheesecake looks amazing! Oh! it looks soooooo lovely! I love cheeseckaes, and this double cheese cake is gonna b just too good, i'll try it and let you know. Thanks for sharing its recipe!! 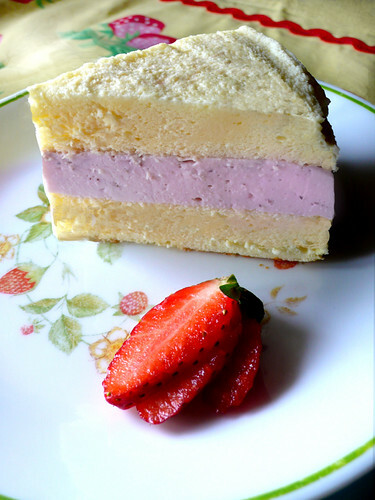 combining baked and gelatin cheesecake - why haven't I thought of that? :) That combination must be wonderful! I mus try that one out with the lot of berries stacked into the freezer. What an interesting cheescake, Santos! Does your powder gelatin packet contain only 1 tbsp? Or do you mean one packet of gelatin plus 1 tbsp of gelatin? The cheesecake looks great! Is it possible to use pectin instead of gelatin? hillary, thanks for stopping by,i hope you'll return. kevin, it was super-fluffy, but still quite rich. hi mona, let me know how it turned out for you! evelin, yes! any berry should work. hi oiyi, yes, the packets of gelatin i have are 1 tablespoonful each, so in case you have different sized packets, measure out the one tablespoon. hi reena, i was just wondering if it would work as well with agar-agar. i don't really know the different gel properties of gelatin v agar v pectin, but maybe somebody reading this might...? Am I reading correctly that the baked layer has no flour in it whatsoever???? If I try this with Agar or Pectin, I'll let you know how it works. hi reena, how are you? there is cornstarch/corn flour as a binder, which you can substitute or combine with wheat flour, as long as it's still 1/4 cup. hi melissa! thanks for stopping by and commenting. i hope you come by again! Wow, that double cheesecake looks so wonderful! Am really tempted to make it now. Just wondering, instead of a fruit-based flavor for the rare layer, would it be possible to make it green tea-flavored (using matcha powder)? Do you think it would be nice? Or would I need to add matcha powder to the baked layers as well? What kind of yogurt did you use in your picture? hi PA V, it was whole milk yogurt for sure, but i don't remember if it was Sonyfield brand or Nancy's, but those are the two I use the most, unless it's greek yogurt, and then I use Fage brand (i didn't use greek yogurt for this). I would definitely use lowfat or full fat yogurt to avoid curdling or separating. oh wait, PA V, the full fat/low fat thing is if you were to heat the yogurt but in this case, you don't.